If you’re looking for a fast and convenient way to maintain your workspace then there is no tool greater than Simple Business Cleaning Sheet. The free template gives any employee, supervisor, or business owner the power to organize the entire staff to ensure each department of the store is spotless. Not only can you organize cleaning for department area but you can also list any necessary equipment needed for each task. This is simply a fast and free way to stay organized and make sure your customers have the best experience possible. Scroll down to the bottom of this page and click the link to download the template file to your computer. Once you have the document open, begin to enter the items you want to be cleaned in the first column. For example, if the area of focus is the kitchen, you can include items such as the sink or stove to be cleaned. You may also change the “Location/Area” headers to fit your business better. The next two columns allow you to list what cleaning items and protective gear you may need to accomplish this task. Going back to the kitchen examples, if you have to clean the oven, you may need to use degreaser. You can list that product in column B and perhaps some gloves in column C.
The last thing you will need to do is enter the frequency of these tasks. 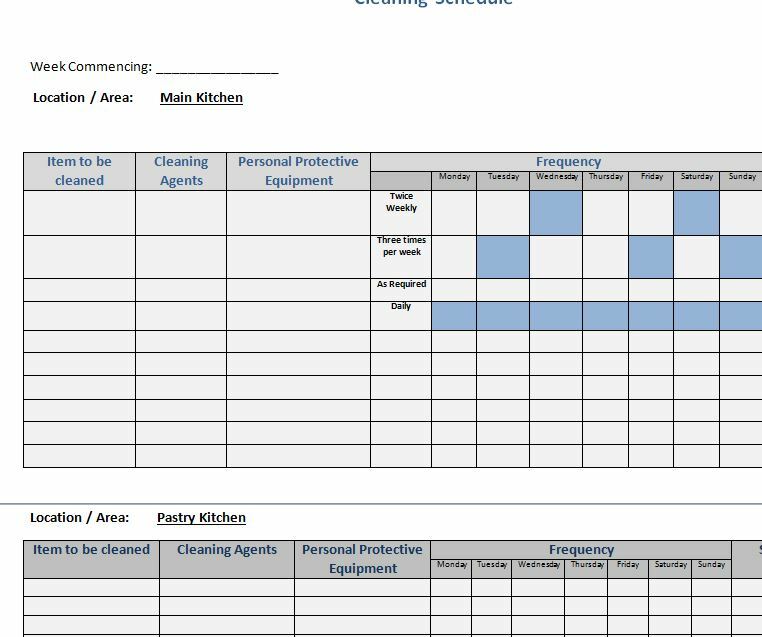 If you want a chore completed on a certain day, simply highlight the corresponding box with the color blue or writing a checkmark in the box if you want to print it out. Have customers coming back after they see the quality of your business and the cleanliness of your store.